While at the Boone & Crockett Big Game awards I shared a breakfast table with Randy Newberg. While telling him about all my preference points and no idea how to best use them he recommended Wagonhound in WY for an archery elk hunt. Taking him up on it I drew the Unit 7 tag and eagerly awaited my hunt. Spent a great deal of time preparing both physically and at the archery range. Made the 2 day trip out by car to retrieve the meat if successful. I arrived Sunday and my guide Cougar Sanchez and Eric Mares went out that night. We climbed some steep hills and he would occasionally bugle to see if we could pin point a bull. I was admiring two 3×3 mule deer with my binos when Cougar says, one’s coming get ready! I get with Eric down in a strand of timber and wait. Soon I see antler tips emerge over the hill in front of us and soon a bull elk is standing in front of me at 40 yards. No shot but it is so exciting and happens just like you have heard it might. He’s with a cow and as they circle around they wind us and take off. This is pretty encouraging for the week ahead. The next day we have breakfast at 4:45 and are off to hunt by 5:30 arriving in the elk woods around first light. Each morning usually involves a challenging hike up some steep hills but I find I can stick with my 20 something guides and get to the top with just an accelerated heart rate. This first day finds another bull elk coming and he emerges off to our side at 42 yards. He stops broadside and I let loose, my arrow flies above his back. I used the orange 60 pin instead of my 40! Pretty rattled but glad not to have wounded him. We regroup and decide to spend lunch back at the lodge. Monday night is another incredible experience. We see a monster on the opposite side of the mountains but he’s not coming. We hike up and then down into a narrow draw. This ends up being a great spot as first a bull comes from the wrong side and winds us. Then two raghorns emerge from the upwind side and proceed to feed within 15 yards of Eric and I who stay motionless. Hope to get his video of that. Soon after a 5×5 comes in within 20, I could shoot but he’s too small. We head back down and now the big bull starts coming. He even walks right by where we were set up earlier but now the wind is wrong and he never comes in. After that four big bulls way up top in some aspens start coming to us. I can’t believe it as they are so far off yet with my binos I see one actually trotting down the mountain. We set up and first it’s raghorns again and some cows with the big one behind a large group of trees. We hear him raking but he doesn’t come in time before the elk get behind and wind us. Tuesday morning starts out the same. A steep hike up the mountain until we emerge into some sparce timber. We set up again as there are bugles in the distance. Eric is right behind me with Cougar set up 40 yards back this time with a Montana Decoy cow. Soon we hear a bull coming but he passes across 50-60 yards in front of us. Eric and I decide to move forward 40 yards. We get settled and soon that big bull comes back to us. He’s facing us with a cow and soon spooks off. I’m thinking maybe this spot is now blown but Eric tells me to get ready, ‘some are coming fast’. He’s not kidding. It sounds like a stampede the crashing coming close and I draw as two bulls literally crash into the woods and stop right next to us. They are both good bulls. I try to shoot the closest one and he spooks a little and I shoot behind him. Amazingly they don’t bolt off. I knock another arrow. Now they are a little behind us. I’m able to draw and rotate my body and shoot the rear one at only 25 yards. My green nockturnal lights up perfectly behind the crease and he runs off. I can’t believe it. We both think it’s a perfect shot. Deep penetration. We just sit still and for the next 45 minutes the show continues. Not long after my shot at 7:17am another bull comes in to my left with a cow. We just sit and video with our phones. After 45 minutes we decide to look for blood. He left with my arrow but we soon find a good blood trail. After about 75 yards we crest a rise and see him laying in the distance. 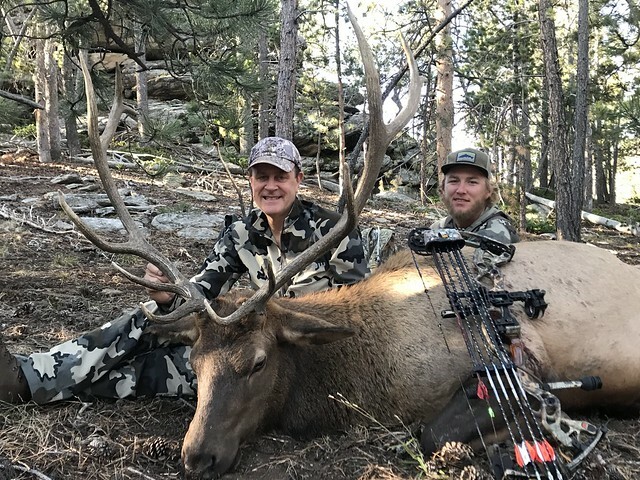 I am overjoyed, my first bull elk with a great shot and clean kill. We take lots of pictures and then Cougar and Eric skin and quarter him out. They are intent on packing him out in one trip which seems nuts to me but to their credit we somehow do it. It’s about a mile down to a road that we can bring the truck to. We rest every 100 yards or so with them doing the lion’s share and me with only a shoulder precariously on the bow holder of my day pack. We get my elk meet back and hanging in the Wagonhound cooler within hours. Am so pleased as getting the meat is a big part of the experience for me and I know it will be perfect. Many times in archery if the shot is not perfect you need to leave the animal overnight which would have made a big difference for the meat. Am so pleased with this experience, greatful for Randy’s advice, all the great help from Wayne and Roger at Archery Only, without them I would not be a bow hunter. All the people at Wagonhoud. I leave Thursday morning and spend the night in Wendhover, NV. Up early and back to Los Gatos Meats & Smokehouse by 3pm. They know me well there and wrap up the tenderloins for me to cook that night. So grateful for another incredible hunting first. Now turning my attention back to rifles and prep for my California Desert Sheep hunt in December.